Hey there! 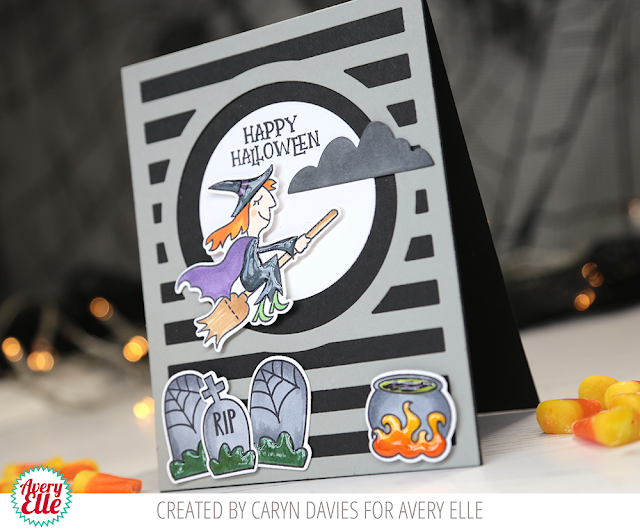 It's Caryn and today I'm sharing a fun and spooky little number I created using some of the AHHHH-mazing new products from the brand new Fall 2017 release. I won't lie, after Christmas, Halloween is my favourite of all the holidays. As much as Summer is great, I can't wait for the shops to start displaying their Autumn/Fall wares. In fact I was in Costco a couple of weeks and they were already starting to bring out their new Halloween goodies - woohoo!! So onto today's card. I've used the fabulous Bewitching stamp set (that little witch is a hoot) and thought it would pair great with the Horizontal Stripes frame die from the Summer release and a couple of the elements from the new Cityscape (swoon) die set.. I started with a black A2 card base and die cut the frame from grey cardstock. 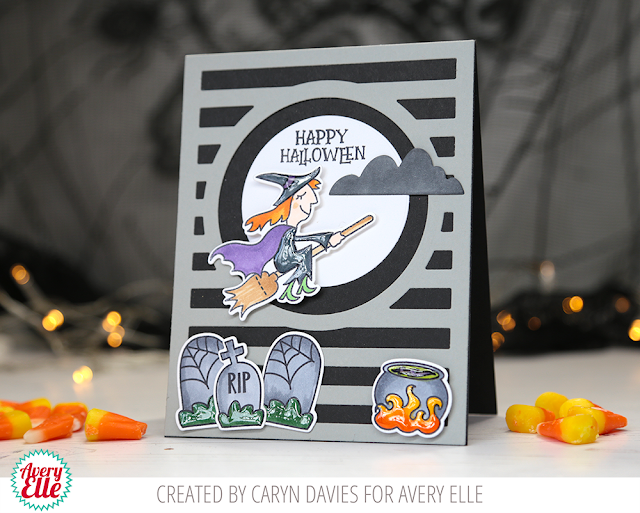 I stamped (using the New Moon Dye ink from Avery Elle (perfect with alcohol markers) and die cut the witch, tombstones and cute little cauldron from the Bewitching stamp set and coloured them with Copic markers. The sentiments in the set were slightly too large for this card so I took the Happy Halloween from Bad Kitty and it fit just perfectly! For some extra bling I added touches of Glossy Accents here and there which is a great way to lift the card and give more interest. The circle (moon) and the cloud are from the Cityscape die set which I know has gone straight to the top of my favourites list! A cute card Caryn, great images.